In October 2018, Hurricane Michael, reportedly the fourth most powerful storm ever to hit the U.S. (based on 155 mph wind speeds), claimed the distinction of being the first ever Category 4 storm to strike the Florida Panhandle. Entire communities were flattened, and utilities and infrastructures were erased as the storm pushed across the southeast, entering Georgia still at Category 3 (111+ mph winds). NASA mapped power outages as swaths of darkness from Florida to Virginia. Though perhaps the “new normal,” it is not just larger and more frequent hurricanes inflicting widespread damage: west coast wildfires are routinely claiming 10 million or so acres annually, and California this year had their three largest fires since 2000 burning at the same time. In the disaster management world, these “Type 1” responses, which the Federal Emergency Management Agency (FEMA) describes as “the most complex, requiring national resources for safe and effective management and operation,” usually exceed 1,000 responders and related personnel, and many are far larger. The 2003 Shuttle Columbia recovery, at that time the largest interagency emergency response ever mounted in the U.S., fielded 5,000 personnel during the peak of the operation. The 2010 Deepwater Horizon oil response required around 50,000. One of the first orders of business is to establish the response structure for the event, and although everyone urgently wants the power, water and sewer back on, historically utilities are left to handle their own business while the main response focuses on evacuation, search and rescue, food, water, public health, debris, and housing. This is not effective in an age of integrated, super-sized responses, and inevitably leads to expensive, wasteful resource conflicts and duplication of efforts. Left to their own devices, utility IMTs have begun appearing on the scene of recent disasters in coordination with the Department of Energy and the U.S. Army Corps of Engineers. A well-documented example was post-Hurricane Maria in Puerto Rico in 2017, where mainland utilities inserted at least seven IMTs, one for each of the island’s seven power authority regions. However, the rush to rebuild in any disaster zone drowns out discussions of how to create stronger infrastructure. Why do we expend huge resources simply to replace what was there and expect it to fare any better in the next hurricane? To address this question, utilities must look beyond the IMT for a leadership role in the Unified Command. Why is a Unified Command seat so strategically important? In an expanded response structure, the UC is made up of representatives from jurisdictions and agencies having authority or functional responsibility for the incident. This group determines priorities and objectives, organizational response structure, cost-sharing procedures, financial agreements, General Staff personnel designations, procedures for public release of information and resolves any other management agenda item that affects the operation. In very simple terms, the UC writes the script for the entire response, and all operational personnel answer to this group — including IMTs and their Incident Commanders. The formal setting in which the UC operates is the daily Unified Command Objectives Meeting, a cross-section of political and jurisdictional leadership all in one place, unified in their mission, and offering undivided attention. 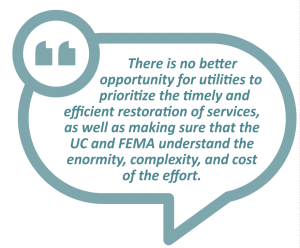 There is no better opportunity for utilities to prioritize the timely and efficient restoration of services, as well as making sure that the UC and FEMA understand the enormity, complexity, and cost of the effort. The Unified Command has the authority and the means to evaluate all response and recovery options, set approved plans as formal mission priorities, and allocate the funding and resources to make them happen. Conversations should include options created by the recently-enacted Disaster Recovery Reform Act of 2018 (DRRA). Though the DRRA authorizes funding of public infrastructure projects that increase community resilience before a disaster occurs, FEMA notes in their DRRA briefings, “According to a 2017 National Institute of Building Sciences report, the nation saves six dollars in future disaster costs for every one dollar invested in mitigation activities,” making this exactly the right time and place to discuss undergrounding utilities or other strategic proposals to increase community resiliency against future events. There will be little disagreement over keeping on the lights. 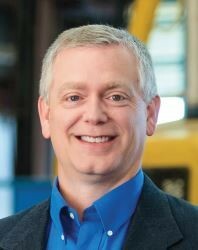 Approved priorities become part of the Incident Action Plan (IAP), and now the utility IMTs can thoughtfully execute their portion of a coherent strategy instead of just scrambling and trying to survive. The lesson here is that operating with UC support and direction is the difference between driving the response or hanging on for the ride. It also takes the worry out of whether all that work you are doing will be covered by FEMA reimbursement. In the case of multiple jurisdictions or utilities, consider how you will work together and be represented in this process, since there will likely be only one utility representative allowed into the UC, that same as with most or all other agencies or responsible parties. Make sure your candidate has the delegations of authority, the inclination and the knowledge to fill this role. He or she may also need external support regarding understanding technical proposals, how best to integrate utility efforts into the overall mission of the response, liaising with relevant others, meeting preparation etc. Substitution or replacement is allowed, but the person who rotates in must have the same authorities, operational awareness, and cooperative spirit as the original. As discussed in this article, disasters and responses continue to grow in size and complexity. 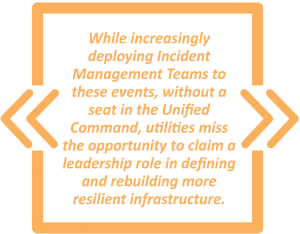 While increasingly deploying Incident Management Teams to these events, without a seat in the Unified Command, utilities miss the opportunity to claim a leadership role in defining and rebuilding more resilient infrastructure. Hopefully, you now have a better understanding of how that happens, why UC representation is so strategically important for utilities, and what is needed to get there. Plan now, because failure by utilities to prepare and execute will cost lives and money, create unnecessary drama, drag out recovery time and do nothing to make our energy infrastructure more resilient.